Hope you all had a good Christmas , today i have a tutorial for you. For my build setup i have Kali Linux installed in vmware, you could use virtualbox also. If you have it installed on your pc,,more power to you. Please note: this tutorial will not show you how to install linux neither how to root your android device. I tested on a nexus 5 (my phone) and i have the latest marshmallow 6.0.1 on it and device is rooted. 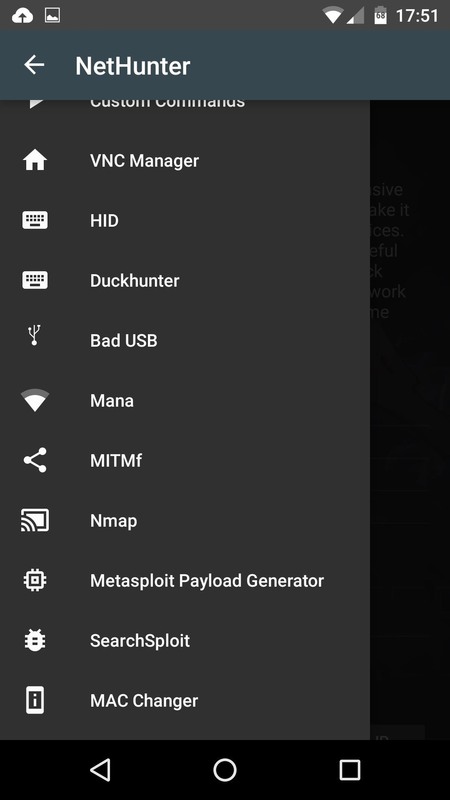 It's not very complicated, if you ever built android roms or aosp from source it's a lot easier, the Nethunter guys made a script that pretty much does it all by itself. Once it's done,,you will have a zip file into the AnyKernel2 folder, and this is what you are going to flash in recovery to install NetHunter to your device. The new installer is using aroma so you will be able to choose what to install. When aroma will install it's probable that it will stuck at 40% for a couple of minutes, don't worry, let it do his things,,but if you are stuck there for more than lets say 10 minutes just force shudown your device by holding the power button down and reboot,,Kali NetHunter should have been installed correctly anyway. 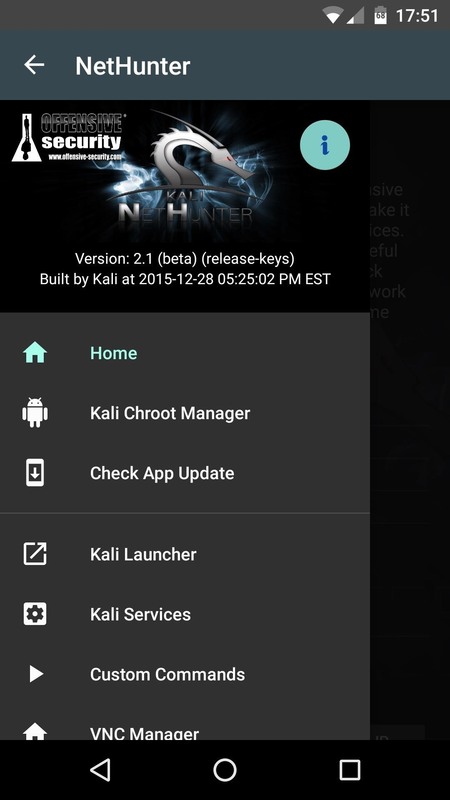 Make sure that once you boot with your new KaliNethunter go into the Kali app and update the chroot. Once in a while "Check app update" inside the kali app, that's how you will keep up with new features once they are added to github. That's about it, if you have any question feel free to ask. Net Hunter on Android is not something to do just for fun. It's pretty easy to screw your partitions, permissions and unless you know what permissive mode is I wouldn't even think about it. You need Kernel support for starters and the list goes on and on especially on a semi supported device like my Nexus 6P but with the AK kernel and a few other bits I did manage to get it running on the 6P fairly smoothly. Is there anyway to run on my Galaxy s4 Mini?? Can anyone tell me Nethunter Run on nougat ?